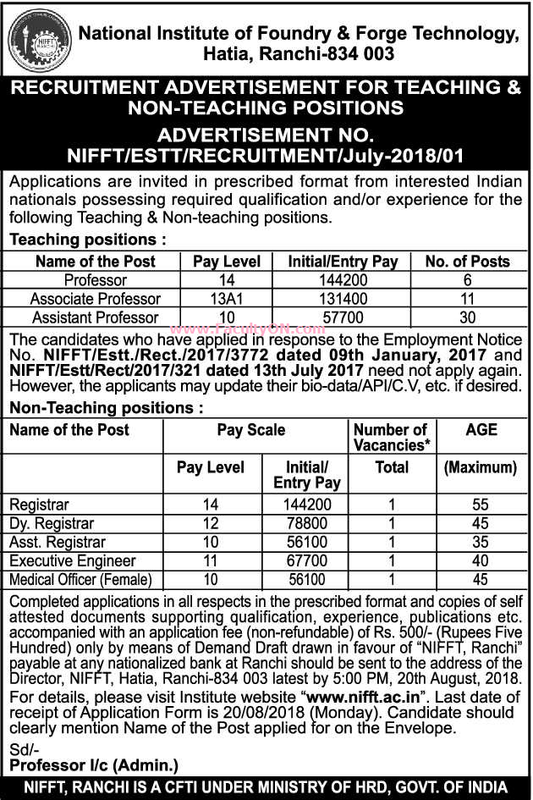 National Institute of Foundry & Forge Technology (NIFFT), Ranchi has advertised in THE HINDU newspaper for recruitment of Teaching Faculty- Professor / Associate Professor / Assistant Professor Plus Non-Faculty jobs vacancies. Interested and eligible job aspirants are requested to apply on or before 20th August 2018. Check out further more details below. About College : Industrial development play an important role in the development of the country. To Provide the requisite quality & quantity of trained man power at different level, Govt. of India set up the National Institute of Foundry and Forge Technology (NIFFT) in the year 1966 in collaboration with UNDP-USESCO. NIFFT is registered as Society under the Societies Registration Act of 1860. Application Fee: Demand Draft of Rs 500/- drawn in favour of "NIFFT, Ranchi" payable at any nationalized bank in Ranchi for each application (50% in case of SC / ST & fully exempted for women & PwD candidates). How to Apply: Interested and eligible candidates are requested to send completed applications filled in all respects in the prescribed format and copies of self attested documents supporting qualification, experience, publications etc. accompanied with the said application fee DD to the postal address provided here.